Found 5 or so on sale in the Northwich branch. Being Sainsburys I assume that this is a local deal so offered on that basis only. Photo is from that branch. The drives inside are Seagate SATA drives and easily removed for PS4s etc. Hope this might be of use to anyone in the area if they haven't already gone. What speed are the drives inside? Standard 5200/5400RPM? Sainsburys deals are very specific to stores - been looking for these at £50 for some time BUT there are local stores to me that still sell at £79 - I know because I called their call centre TODAY to check !! IT IS TIME FOR HDUK TO HAVE A SPECIFIC SECTION FOR LOCAL ONLY DEALS! There is a button on the app for 'local' deals but the app would not let me upload this deal until I deselected it. Go figure. I did search before posting but the already posted deal did not come up. Feel free to delete if you wish. Would love to check if they have it in my local store - anyone have a product code? Call their call center and quote the above and your store location. Good Luck in finding any at £50 - I can't !! Every store near me sells them for £79 !! 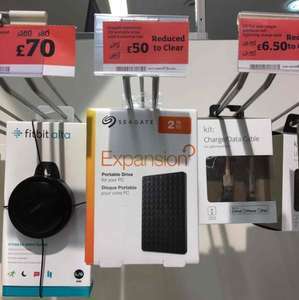 Seagate 5tb for £89.99, after £5 voucher. haven't seen a better value yet!